A child's dental appointment involves many of the same elements as an adult dental appointment, but there are a few differences. 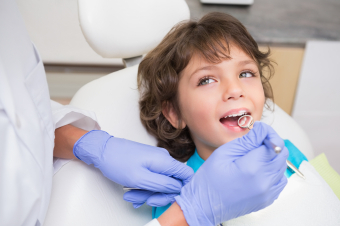 Here, our Fort St. John dentists explain what to expect during your child’s dental appointment. During a typical dental appointment, the dentist or dental hygienist will perform a thorough professional dental cleaning on your child's teeth. This procedure is the same whether your child has primary or adult teeth. The cleaning will include scaling to remove any tartar build-up, a professional flossing, and polishing. The dentist will also examine your child’s teeth, gums, the interior of the mouth, and the jaw for any problems, such as gingivitis, tooth decay, oral abnormalities, and misalignments of the teeth or jaw. To help find problems that are not visible to the naked eye, the dentist or hygienist will occasionally perform an x-ray on your child’s teeth. The dentist will only perform an x-ray when necessary. Their frequency depends on a variety of factors, such as your child’s general oral health, risk for dental disease, and stage of development. Fluoride is a mineral found in soil, water, and some foods. Fluoride is important for oral health and development because it makes teeth more resistant to decay, and can even reverse decay that has already started in some cases. Getting enough fluoride is important for everyone, but especially for children, because their teeth are still growing and developing. During your child’s dental appointment, your Fort St. John dentist will discuss your child’s fluoride needs with you, and together you'll settle on a course of fluoride delivery. The dentist or hygienist will end the appointment by reviewing proper at-home dental hygiene with you and your child (if your child is old enough to understand). This will include tips and advice on proper brushing and flossing techniques, oral health-friendly dietary information, and much more. They will also be happy to address any questions or concerns you have about your child’s oral health. If your child has a cavity or other oral health problem, our administration team will book a follow-up appointment to monitor or treat it. You can book this appointment at our office, or call us any time. For more information about what you can expect from your child’s dental appointments, please contact our Fort St. John dentists today!